Below is the list of SEI CERT rules and recommendations supported as of RuleChecker 18.04. Light-colored items are additionally supported when using RuleChecker in conjunction with Astrée. Exclamation marks denote recom­men­da­tions that, by definition, cannot be checked for automatically by any tool. Further details on individual rules are available via RuleChecker’s “Help” menu or by contacting info@absint.com. DCL08-C Properly encode relationships in constant definitions ! DCL11-C Understand the type issues associated with variadic functions ! DCL17-C Beware of miscompiled volatile-qualified variables ! DCL21-C Understand the storage of compound literals ! DCL22-C Use volatile for data that cannot be cached ! INT00-C Understand the data model used by your implementation(s) ! INT02-C Understand integer conversion rules ! FLP00-C Understand the limitations of floating-point numbers ! FLP01-C Take care in rearranging floating-point expressions ! ARR00-C Understand how arrays work ! FIO14-C Understand the difference between text mode and binary mode with file streams ! SIG01-C Understand implementation-specific details regarding signal handler persistence ! ERR06-C Understand the termination behavior of assert() and abort() ! WIN03-C Understand HANDLE inheritance ! 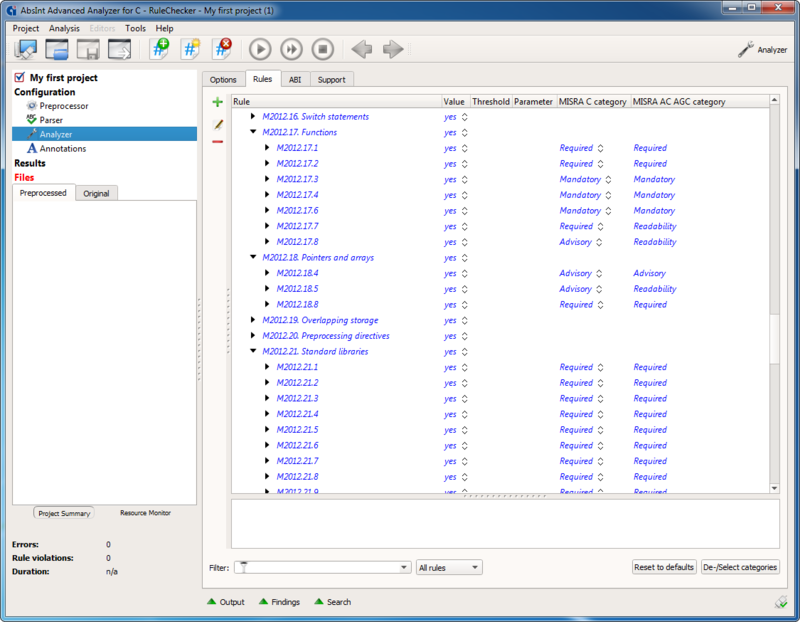 RuleChecker supports both MISRA-C:2004 and MISRA-C:2012, including Amendment 1. It is highly configurable, allowing you to check for individual rules and even specific aspects of certain rules. Below is a quick overview of all the supported rule categories. A detailed description of how RuleChecker handles each rule is available on request. Contact info@absint.com for your free copy. Support for C++ is available starting with release 18.04, which supports a majority of MISRA C++:2008 rules. Below is the list of supported CWE rules as of RuleChecker 18.04. This includes items with the CWE CCR accuracies Exact and CWE-more-abstract. The following rules are additionally supported when using RuleChecker in conjunction with Astrée. This includes items with the CWE CCR accuracies Exact, CWE-more-abstract, CWE-more-specific, and CWE-partial. For further details, see RuleChecker’s “Help” menu or contact info@absint.com. Below is the list of ISO/IEC rules and diagnostics supported as of RuleChecker 18.04. Further details on individual rules are available via RuleChecker’s “Help” menu or by contacting info@absint.com. RuleChecker automatically compiles various code metrics. For each metric, you can optionally specify thresholds to check your code against, essentially creating additional rules of your own. We have experience with extending RuleChecker for various customers with their very own in-house rule sets. Please contact info@absint.com with any questions. These optional rules cover the naming of all C identifiers. For each kind of identifier, you can specify a maximum and minimum length, and check the spelling using regular expressions.